A tiny snippet of Commodore Corporate History . . .
suppliers of home computers in the world. sales people and their specialty store prices. stream of Commodore executives followed him. for the quarter after paying off about 1/4 of its bank debt. gods of bankruptcy yet again. In March 1986, Thomas J. Rattigan replaced Smith as Commodore's CEO. the sloppy reporting that had undermined Smith's leadership. Commodore's next move was to release the Amiga line of home computers. Amiga was quickly dubbed the, "save-the-company machine." Commodore's U.S. revenues had declined by 54% in the same four quarters. sold to the German company ESCOM for approx. 10-25 million dollars. the future of Commodore is currently unknown. Looking for the source of this information .. possibly somewhere on USENET of course .. hoping there's more of it ..
Whoever wrote this, it is a simplified and incomplete history. Here's a little more of the Commodore story . . . WHEN AN EXECUTIVE WITH WHOM YOU'VE had a friendly relationship for seven years suddenly ducks your phone calls, you know something's wrong. 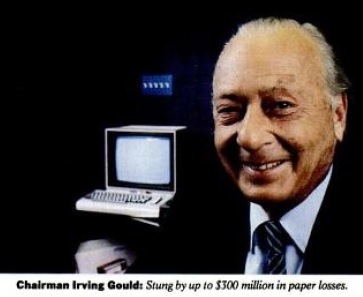 That executive is Irving Gould, the chairman and largest stockholder of Commodore International, the kingpin of the home computer business. And something clearly is wrong. Gould was readily available when the company's business was booming—but not now. One of the great growth companies of the past five years. Commodore has gone into a nosedive. So too, has its stock, from a mid-1983 high of 60 5/8th to a recent price of around 10. As a result, Gould, who has steadfastly held on to his 6 million Commodore shares (20 percent of 'the company'), has suffered a huge paper loss—up to $300 million in less than two years. Who knows? With that kind of trouble, maybe I wouldn't want to talk to anybody, either. a 93 percent profit decline in the second quarter — has sparked talk on Wall Street that the company is headed for serious financial trouble. perhaps even bankruptcy. Such speculation is labeled by the company as "ridiculous." A company official cites strong bank lines. good potential for new models, and declining inventories of aging products — notably the Commodore 64 model computer, which retails for around $150 and has been the best-selling home computer in the world. However, several savvy Wall Street watchers of the microcomputer business tell me bankruptcy at some point is a possibility, especially if Commodore's much heralded new Amiga computer turns out to be a dud. The Amiga. a higher-priced model (around $1,500) with advanced color graphics, is supposed to be out later this year. Its big competitor, Apple Computer's Macintosh, sold by some dealers at a discount price of between $1,700 and $1.800. Commodore's rapid decline tracks the overall drop in home-computer sales. Thc company, which accounts for about 60 percent of the home-computer market and topped 51 billion in sales in fiscal 1984. started as a family-owned typewriter-repair shop in the Bronx founded by lack Tramiel, a Polish-born survivor of Auschwitz. Gould, a Canadian businessman, bought a piece of the company in 1966, and ten years later Commodore acquired a semi-conductor firm that was the springboard into lower-priced home computers. Tramiel, regarded as the operating brains of the company, left Commodore in January 1984 to take control of Atari. Today, in addition to Commodore's other problems, a company subsidiary is being questioned by the Internal Revenue Service about certain tax savings the subsidiary claimed. "There is a possibility of bankruptcy," says Doug Cayne, an analyst at the Gartner Group, a technology-research outfit in Stamford, Connecticut. His views sum up the thinking of several analysts. "If Amiga makes it, the company will do a lot better. If it doesn't, the company's problems (operating losses and declining sales] will intensify." Gould has previously said he expects renewed profitability "in the near-future." But the company won't clarify what he means by "near-future:' In fact, if you listen to Clive Smith, Commadore's vice-president of corporate planning, you can get the idea that a return to profitability over the short run is anything but likely. Says Smith. "We're introducing four new products—two in the US, and several in Europe. And there's going to be a lot of start-up costs." Obviously those high start-up costs figure to eat heavily into potential earnings. In any case. Gould's expectation of a short-term return to the black is greeted with skepticism by a number of Wall Street analysts. One is First Boston's Charles Wolf. Commodore has already indicated it will have a fourth-quarter loss, and Wolf thinks the loss will be a whopper—about $25 million after taxes. That would mean a total loss in fiscal 1985 (ending June 30) of $15 million, or 50 cents a share. What's more, Wolf sees a loss of a similar magnitude in fiscal 1986. Wolf, who recommended sale of Commodore's shares in mid-December, when they were selling at about $20, thinks they should be sold even at half that price. And his negative view takes account of both the company's near-term prospects and his current assessment of the Amiga. Near-term, he notes, the company is sifting on an inflated inventory — around $400 million—the bulk of it related to the Commodore 64 computer. "It's just like the video-game episode of two years ago," Wolf says. "Interest in video games died overnight, and interest in lower-priced, limited-function computers also appears to have died." Commodore has vehemently denied it plans any huge write-down of its existing Commodore 64-related inventory. but Wolf, along with a number of other analysts, sees this as a distinct possibility. "The U.S. market has disappeared on them, so big markdowns are very possible," he says. And if they mark down the price of the 64 even mo re (in February, its price was cut 25 percent from the $189-to-$199 level), "you could see Commodore lose as much as $2 a share this year," Wolf says. Wolf's doubts about Commodore also extend to the two big new products the company has been touting — the 128 computer and the Amiga. The 128 model, a more powerful version of the Commodore 64 that is due out shortly and is expected to retail in the $269-to-$299 range, is described by Wolf as little more than "an enhanced 64 with bells and whistles" — a view shared by other analysts. "I know it ain't going to save the company," adds Wolf. As for the Amiga, Wolf says, "unless it's dramatically better than anything in the market, it's going to have only modest sales. So you're talking about a big if." There are just too many uncertainties with this company, and that's why the stock should be sold, he says. Mark Manson, an analyst at Donaldson, Lufkin & Jenrette, raises another question on the minds of a lot of analysts — whether there's actually a market for a machine like the Amiga. It's not clear that people will buy a machine specifically for its graphic capabilities. Several analysts also raise questions about Commodore's ability to develop a proper dealer network for the Amiga, since the company's business is done largely with mass merchandisers like K-Mart. Manson looks for more bad news than good news coming out of Commodore. He refers chiefly to additional competitive threats, notably from Atari (which is thought to be sitting on a huge inventory) and from the Japanese. The bottom line: the prospects of huge write-offs by Commodore on its current inventory and thus a lot more red ink for the company. Commodore's Smith tells me that most dealer inventories are light on the Commodore 64, suggesting it continues to be a good seller at its discounted price of $150. In fact, he suggested I talk to some of the company's customers. I did. And one large Commodore customer told me his 64 inventories were indeed light. But that's because the chain has refused to order any more, an official told me. "The 64 is now a deadbeat." he says. "And the less ill said about the dead, the better." Over the last five years, between fiscal 1979 and fiscal 1984, Commodore produced a dazzling growth rate—a 78 percent compounded annual growth in sales and an 89 percent compounded annual gain in net profits. But that was yesterday. Today, the business it dominates has turned sour, evident not only from Commodore's decline but from IBM's decision to end production of the PCjr, from slowing sales at Apple Computer, and from the plight of Atari, regarded by many analysts as a likely casket case. And so the question arises: Will Commodore be another Osborne—a fast-growing computer company that virtually collapsed overnight and went bankrupt? Yeah, snippet makes it inaccurate. There is a huge gap between 1987 and 1994. And saying that Irving Gould took over (the article's implication is that he was directly in charge) is not the case, because he hired others to replace Rattigan. Thank goodness there are other Commodore histories that are more accurate. Please, we're all eyes and ears for this kind of stuff. Of course. There are the Brian Bagnall books, "On the Edge: the Rise and Downfall of Commodore", "Commodore: A Company on the Edge", and "Commodore: the Amiga Years". Then there is the the Ars Technica series of articles at arstechnica.com/series/history-of-the-amiga/. Finally, there is David Pleasance's book, "Commodore: the Inside Story". All very revealing in trying to piece together this era. Fascinating .. which portions of those well known references do you find particularly accurate, and tell us why .. in lurid textual detail. Nah, you yourself will have to read and buy the books and look through the Ars Technica articles, just like I did. Too much work to post on-line! Too much work? ................................... ! It's easier just to cast blank critiques and insipid asperations then ? Cheers ! .. and thank you for your incredibly constructive commentary !